Does the stuff you do purely for you always fall off your to-do list? Is there never enough time in the day to fit in meditation, exercise, reading or whatever it is you know will make you a better and healthier human being, parent, writer – or whatever it is your aspire to improve at? If so, do yourself a favour and get a morning routine. Your writing, your work, your health – and your family! – will thank you for it. In today’s always switched on world we are continually try to keep the numerous challenging balls of our lives in the air. Work, kids if you have them, commuting, shopping, cleaning, washing, exercise, cooking. All of the above place huge demands on the limited amount of time we have at our disposal in each day. On top of this is the constant barrage of information thrown at us by our phones, computers, tablets and TVs. Is it any wonder there’s no time left for us, to feed our creativity and fuel our self-improvement? Not long ago if I woke up before my daughter the first thing I did was pick up my phone because I used it as an alarm clock. Once I’d turned off the alarm I would often waste 45 minutes browsing through meaningless crap on Facebook. Then I’d spend the next 45 minutes tell myself off for wasting precious time! It wasn’t a healthy, or productive way to start the day. So when I decided to start my own business I knew I had to become more self-disciplined. I can no longer afford to lose that key hour of the day, when my mind is at it’s most alert, to pointless social media browsing. So the first thing I did was get an alarm clock and leave the phone charging in my office. But more self-discipline than that seemed unlikely? Me? First thing in the morning? Before coffee? No way. Thankfully around the same time I stumbled across the genius of Hal Elrod’s Miracle Morning via Jo Gifford, The Dexterous Diva (see resources below). The very simple – and ridiculously obvious – principle behind Hal’s Miracle Morning is that instead of leaving the practices you know are essential for your health and wellbeing until ‘later’, or until that fictitious day when you’ll have enough time, you get them done in the first hour of the day. Before 8am preferably. Yes, shock horror, before coffee! Because later in the day other things WILL get in the way. You’re too exhausted to exercise, you’ve got work to catch up on, or CBeebies is blaring and you’ve got no chance of concentrating. In his book Hal gives his basic ingredients for a miracle morning routine, but I’ve adapted it to bring in what works for me. 6am – Meditate for 10 minutes. 6.10am Exercise – a 12 minute routine called XBS (see resources). 6.35am Write – 10 ideas a day and a page of free-writing to keep my brain in gear. 9am Walk and listen to podcasts – after school drop off I get out for a brisk 20 minutes stroll around the fields and woods behind my house. Ideally I have the pre-coffee part done by 6.45am, which is when my daughter usually wakes up. However, like the rest of you I live in the real world and if my cheeky monkey wakes up at 6am – which happens often – my routine either goes out the window or needs major adjustment. It’s not ideal to ‘meditate’ while my daughter lies next to me in bed huffing and puffing, or worse poking and prodding me saying ‘ Have you finished meditating yet Mummy’? And I don’t recommend attempting press ups while a four year old sits on your back. But one of the key principles behind the Miracle Morning is that done is better than perfect. You can put it off until you have the right amount of time and the ideal circumstances or you can get it done. I know what I prefer. What is consistent about my routine is that on the days I complete it I feel more centred, in control and feel like I glow with a satisfying sense of accomplishment! I’m also calmer, more patient with my daughter in that fraught half hour before we leave for school, and consequently, dare I say it, mornings are far more fun. Which it turn means I’ve started to look forward to my mornings – that little portion of time that’s just for me, the calm before the storm. Starting on such a positive note seems to continue throughout the day. I’m better prepared for whatever comes my way and more productive. Even if everything else goes haywire I’ve know I’ve already had the dose of me time that keeps my head above water, done my writing practice for the day, and exercised my mind. All of which are going to make me a better writer, entrepreneur, parent and human being. Little by little. The Dexterous Diva, Jo Gifford’s post that started it the ball rolling. Calm – the meditation app. I recommend the free seven day program ‘7 days of Calm’ as a great way to get started and learn the basics of mindfulness meditation. XBX Plan for Physical Fitness. Royal Canadian Airforce designed fitness programme practiced by Helen Mirren. If it’s good enough for La Mirren, it’s good enough for me! Writing 10 ideas a day is a practice I learnt from James Altucher. Far better to hear about it from the horses mouth than have me paraphrase it. Or better yet read his book Choose Yourself! Do you have a morning routine? If not have I convinced you to try it out? Start by thinking about what’s so important to you that you should probably get it done first so it doesn’t do a disappearing act off your to-do list? Or use my routine as a starting point. Let me know how you get on in the comments. Here’s to calm, satisfying mornings that feed the creative well! I’m a huge advocate of morning routines, Emma-Louise, and love that you shared your routine and the results you’ve gotten so far! I wish I could say that I wait to have coffee after meditation, but coffee must come first! I love the idea of a morning routine. I’m terrible at sleeping at the best of times though so getting up at 6am is pretty tricky. But the idea of those small, manageable ten-minute tasks seem like a perfect way to start the day. I must get myself a morning routine. Yes it works, if the kids don’t interrupt! Let me know how you get on! 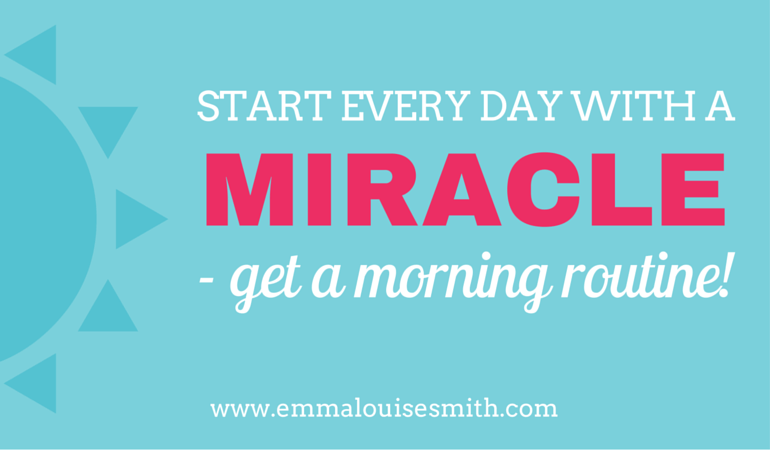 Yes I definitely feel more centred when I fit my miracle morning in! So glad you found it useful – and thank you for reading! Great post and implementing a morning routine has made a massive difference for me. It has been nearly a year and I can see the impact it has had. However, I do think the Miracle Morning is the most over rated book of the past 5 years!!!!! The entire book is pretty much summarised in your post. Save time – read Emma’s fab post instead!